For those of us training at St John’s Richard’s sermon was everything we expect of one of our lecturers, the wisdom of one who teaches on the Bible in Christian Ministry and the Old Testament and delivered with a dry humour rooted in our common experience at St John’s. So not everyone got all the jokes. However, his exegesis of the passage and his critique of traditional christian uses of the Nehemiah passage led him to suggest a very plausible and acceptable understanding of the text. The story of Nehemiah is essentially one of Jerusalem, the city of such hopes and dreams of the people of Israel. I fear that Nehemiah, with his vengeful prayer, doesn’t get a good review but there must be some good in a man who has vision, passion and determination to be the catalyst for renewal. If nothing else it shows that God has a place for all in building his Church. Essentially the thrust of Richard’s teaching was that Jesus is the fulfilment of all the hopes of God’s people that Jerusalem came to symbolise. For those that labour for God’s Kingdom opposition is inevitable and yet God will win the struggle because it is his fight and his kingdom. Christ says that we will face opposition but we should not be afraid because he has overcome the world. The secret of not missing those things hidden in the text is in the bread and the wine and the word. 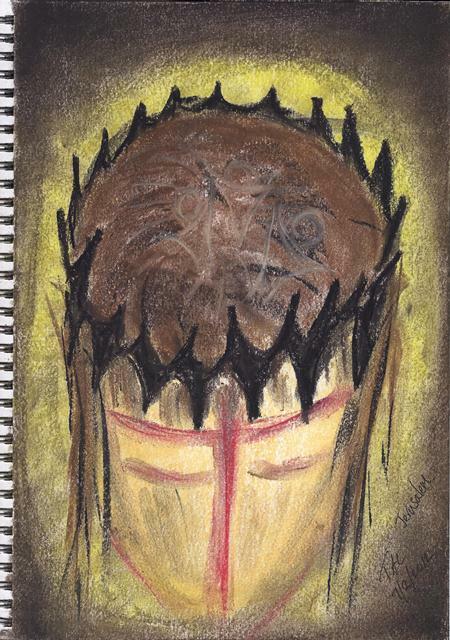 The image uses the crown of thorns as an image of a wall. Within it, and on the crown of Christ’s head, three figures dance. The cross forms the facial features of Christ and so recognises that the New Jerusalem is founded on the cross of Christ. The image portrays the death and suffering of Christ indicating the cost Christ paid for his Church. Perhaps our reaction to those who oppose the renewal of God’s Church and the mission of his kingdom is found in the encounter with the crucified Christ, the living Word.